Fairly common yearlong resident in Mojave and Colorado deserts below about 1600 m (5000 ft), rarely to 1900 m (6000 ft), from the vicinity of Walker Pass, Kern Co. and southern Inyo Co. south to Mexico border. Preferred nesting habitats include desert wash, desert riparian, and palm oasis, but also ranges into Joshua tree and occasionally pinyon-juniper (Grinnell and Miller 1944, Garrett and Dunn 1981). Feeding: Drills for wood-boring beetles and other insects in trees, shrubs, cacti, yucca, agave. Also gleans caterpillars, ants, and other insects from trunks and foliage. Reported to feed occasionally on cactus fruits (Bent 1939, Austin 1976). Cover: Roosts and nests in snag, dead portion of live tree, shrub or cactus, utility pole, or fence post. Reproduction: Excavates a cavity about 25 cm (10 in) deep in Joshua tree, flowering stalk of yucca or agave, cottonwood, willow, mesquite; usually 0.6-6 m (2-20 ft) above ground (Bent 1939). Water: No additional data found, but frequents riparian habitats. Pattern: Inhabits virtually all desert habitats that provide large shrubs or trees, and suitable sites for nest excavation. Home Range: No information found. Territory: Probably territorial, but no information found. Reproduction: Usually lays eggs in April and May. Monogamous; incubation about 13 days, by both sexes. Clutch averages 4-5 eggs (range 2-7). Both sexes care for altricial young. Fledging age unknown (Bent 1939, Harrison 1978). Niche: Apparently little overlap between sexes in foraging. Female tends to feed higher and on different substrates; male tends to forage more by probing and pecking, female by gleaning (Ehrlich et al. 1988). Comments: Detailed life history information apparently lacking. Range overlaps marginally with Nuttall's woodpecker. Austin, G. T. 1976. Sexual and seasonal differences in foraging of ladder-backed woodpeckers. Condor 78:317-323. Bent, A. C. 1939. Life histories of North American woodpeckers. U.S. Natl. Mus. Bull. 174. 334pp. Harrison, C. J. O., ed. 1978. Bird families of the world. Harry N. Abrams, Inc., New York. 264pp. Short, L. L. 1971. Systematics and behavior of some North American woodpeckers, Genus Picoides (Aves). Am. Mus. Nat. Hist. Bull. No. 145. 118pp. The Ladder-backed Woodpecker is a small woodpecker about 16.5 to 19 cm (6� to 7� inches) in length. It is primarily colored black and white, with a barred pattern on its back and wings resembling the rungs of a ladder. Its rump is speckled with black, as are its cream-colored underparts on the breast and flanks. Southern populations have duskier buff breasts and distinctly smaller bills. Adult males have a red crown patch that is smaller in immatures and lacking in adult females. 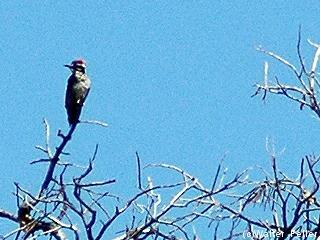 The Ladder-backed Woodpecker is fairly common in dry brushy areas and thickets and has a rather large range. The species can be found year-round over the south-western United States (north to extreme southern Nevada and extreme southeastern Colorado), most of Mexico, and locally in Central America as far south as Nicaragua.